SB-129 (Episode) – From SpongePedia, the biggest SpongeBob-wiki in the world! 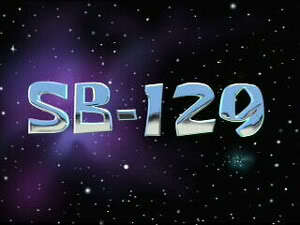 SB-129 is an episode from Season 1. It is Sunday morning in Bikini Bottom. Squidward's house is shown where Squidward is getting ready to play his clarinet. He kisses his clarinet and walks to his window. He opens his window and gets ready to play. At SpongeBob's house, SpongeBob's alarm clock goes off causing the clarinet to go into Squidward's throat. He starts to choke. SpongeBob tells Squidward, "Good Morning." SpongeBob then asks Squidward if he wants to go jellyfishing. Squidward tries to yell at SpongeBob, but the clarinet blocks his words and just comes out as clarinet sounds. Thinking that Squidward said that he did want to go, SpongeBob says that they (SpongeBob and Patrick) will be right over. Squidward goes back inside and pulls the clarinet out of his mouth. Squidward hears a knock on his door. He walks to the door and opens it to see SpongeBob holding a Jellyfishing net and Patrick. SpongeBob asks if Squidward is ready to go jellyfishing. Squidward says that he is not and slams the door. Patrick says that Squidward does not want to play with them. SpongeBob denies this and says that Squidward is just not ready yet. Squidward is shown about to play his clarinet, when he gets a knock on his door. He goes to the door and opens it to find SpongeBob and Patrick. SpongeBob asks if Squidward is ready yet and Squidward responds that he is not. Squidward is about to play his clarinet again, but he hears a knock on his door, goes to it, opens it, and finds SpongeBob and Patrick. SpongeBob asks if Squidward is ready yet and Squidward responds that he is not. Squidward is about to leave when he hears a knock on his door. He opens it and finds SpongeBob and Patrick. SpongeBob asks if Squidward is ready yet and Squidward responds that he is not. This exchange happens a few more times until SpongeBob and Patrick are no longer shown outside Squidward's house. Squidward continues to says, "No!" as SpongeBob and Patrick walk up behind him. SpongeBob taps Squidward's shoulder. Squidward asks, "What?" and SpongeBob asks if Squidward is ready yet. Squidward says that he is not. He then slams the door on SpongeBob and Patrick, but now Squidward is on the outside and the two are on the inside. Squidward starts to walk away when he realizes that he has left his neighbors in his house. He walks back to his house and knocks on the door. SpongeBob and Patrick answer the door. SpongeBob asks if Squidward is ready yet. Squidward slaps his head and walks in and tells the two to get out while he pushes them out. Squidward asks if SpongeBob should be at work. SpongeBob says that he would, but it is Sunday and the Krusty Krab is closed on Sundays. Squidward realizing something, says that he will be right back. Taking another exit, Squidward, holding his clarinet, sneaks past SpongeBob and Patrick. Squidward sneaks to the Krusty Krab. He goes inside to hide from his neighbors. Squidward asks if anyone is there and gets no response. He is about to play his clarinet when he hears SpongeBob and Patrick saying his name. Squidward runs into the kitchen. SpongeBob and Patrick look inside the Krusty Krab. Squidward gets to the walk-in freezer and the two say his name again. Squidward goes into the freezer. SpongeBob and Patrick walk into the kitchen and say his name again. Squidward looks out of the freezer window and the two say his name again. As the two pass the door, Squidward hides. He goes back to looking through the freezer window. Thinking that Squidward is not there and probably at Jellyfish Fields, the two leave. Squidward tries to open the door, but the handle is stuck. Squidward thinking that someone will find him there, says that he will be out of there in no time. 2000 years later, in the year 4017, the hinges break and the door and Squidward fall forwards. The "Krusty Krab" is shown and it is chrome. A creature that looks like SpongeBob, but with jets instead of legs, floats by. He realizes that Squidward is there and he floats back. He stops and his jets turn into legs. He takes out a chrome hammer suggesting that he will use it to break the ice. However, a laser comes out of the hammer and it melts the ice until Squidward feels it. He breaks the rest of the ice. Squidward repeats his last line from the 21st Century. The Future "SpongeBob" greets Squidward calling him, "primitive." Squidward thinks that he is SpongeBob and says SpongeBob's name. The creature corrects him and says that he is "SpongeTron." SpongeTron welcomes Squidward to the future. He notices that everything is chrome in the place he knows as "The Krusty Krab." He asks why everything is chrome. SpongeTron says that everything is chrome in the future. He looks outside to see that everything is chrome. A plant grows out of the ground, it is not chrome. A truck arrives and a fish with a paint can arrives and sprays the flower "chrome." SpongeTron introduces Squidward to three of his clones, "SpongeTrons X, Y, and Z." Squidward asks if any of the other letters involved. SpongeTron answers that they are and that there are 486 letters in the alphabet. Squidward lies down and curves up and says "Future" a few times. SpongeTron or one of his clones pulls his tie and a hand with a brick comes out of his hat and it lets go of the brick on top of Squidward's head. Squidward thanks the SpongeTron that dropped the brick on his head. Squidward says that they have to do something. Either the three clones or SpongeTron and two of his clones take out jellyfishing nets and say, "Jellyfishing!" A zap of light appears and a starfish that looks like Patrick, but has two heads instead of one. The creature says, "Did someone say, 'jellyfishing'?" and takes out a jellyfishing net. Either SpongeTron or one of his clones greets the creature saying that he name is "Patron." Squidward says that he has to go back to his own time. Either SpongeTron or one of his clones tells Squidward that the time machine is down the hall on the left. Squidward walks to the door and enters the room. Can opener sounds are heard and Squidward walks out in pieces. Either SpongeTron or one of his clones says that that is actually the can opener room and the time machine is on the right. Squidward walks into the room. The room has pink and purple striped wallpaper, a green floor, and a hanging lamp. It also has a panel on the wall. The panel has a lever two options, "Future" and "Past." The lever is in the "Future" setting" On panel's right, there are three buttons, red, yellow, and white that flash in that sequence. On the panel's left, there is a key in a key hole. Squidward says that he would not have chosen the interior. Squidward examines the panel and concludes that if "SpongeBob" is in the future, he has to go to the past. He turns the key and switches the lever to the past. Outside, either SpongeTron or one of his clones waves goodbye. A flash, similar to that of the one that indicated Patron's arrival, happens and the time machine disappears. The time machine goes through the time-space vortex and ends up in a prehistoric period before that of the one from "Ugh." Squidward looks out to see where he has landed. He leaves the time machine and starts walking. A primitive tapeworm appears and slithers above Squidward nearly hitting him. Squidward says that this must have been before manners where invented. He continues walking and says that there is no sign of SpongeBob. Squidward says that maybe he can finally be alone with his clarinet. He hears a noise. He sees a silhouette. He hears another noise and sees some eyes. Squidward starts to get nervous. He sees another silhouette. He sees another silhouette. He sees a figure. He sees two more silhouettes. He backs into a small kelp area and hears a rustling. He looks into the kelp and sees a primitive sponge. It looks at him. It jumps towards him. Squidward tells the primitive sponge to stay back. The primitive sponge touches him and then smells his finger. The primitive sponge offers Squidward his finger. Squidward says, "No thanks." A puff hits the back of Squidward. He turns around and sees a Primitive starfish. The primitive starfish smiles and Squidward says, "Hello" and says that he better get going. The sponge holds onto Squidward's arm and examines it. The starfish puts his hand in his mouth. The starfish freaks out about a jellyfish. Squidward says that it is just a jellyfish. The sponge freaks out. The two freak out together and Squidward says that he will walk away now. He does so. He finds a rock and sits down. He plays a little and hears the hollering of the sponge. Squidward plays some more and hears the hollering of the starfish. Squidward then hears the sponge's hollering again. Squidward walks over to the two who are handing each other the jellyfish and it is shocking them. When Squidward gets there, they release the jellyfish and it tries to get away. Squidward explains that they are supposed to catch the jellyfish. Squidward asks them to give them their loincloths. They do so, but they only give him a layer of the cloth. taking a stick, Squidward makes a jellyfish net. He gives the jellyfish nets to the two. They put it on their mouths. Squidward hits his face and takes the nets back. He then demonstrates how to Jellyfish. The jellyfish flies out of the nets and the two follow it. Squidward sits down and begins to play the clarinet. The two are enjoying themselves. They get angry at the bad music. They start to chase Squidward. Squidward enters the time machine. He pulls the lever back and forth until it brakes. The setting that read, "Future" turns into a lottery machine and Squidward gets two lemons and a "bar." A voice says, "Loser." On the outside, the sponge and starfish are beating on the time machine. The time machine flashes and then disappears. Squidward goes through the time and space-vortex again, but this time weird things are happening. He ends up in a white area that some call, "Nowhere." Squidward walks around and then hears a voice. He looks back and nothing, but a few squares are in the place. He lifts a light blue square. It floats and fades away. Squidward says that he is there is no SpongeBob. Squidward lays down and says, "I may have finally found a place where I can be all alone." When he says this, he gets smaller and when he says, "Alone" a speech bubble appears that reads, "Alone." Other voices that are attached to speech bubbles say, "Alone." Squidward gets nervous and says that he has to get out of there. He runs in a cycle until he stops. He asks where the time machine is. He then asks where anything is. He then starts jumping up and down repeating "Where?" until he lands in the time machine. He hits the panel and says that he wants to go home. He says that he misses Bikini Bottom, he misses his house, and that he even misses SpongeBob. There is a flash and the time machine lands in 2017 on Conch Street. The door opens and Squidward looks out to see SpongeBob and Patrick. He says their names. They greet him. He tries to explain what he went through. The two take out nets and ask if he wants to go jellyfishing. Squidward says, "No!" and asks who invented the game. SpongeBob and Patrick respond that he invented it. The episode, which arises from Squidward time traveling and inventing the game of jellyfishing while seeking to avoid SpongeBob and Patrick as they want him to jellyfish with them, is an example of a time paradox known as a causal loop, in which a person is inspired or driven by an event to time travel and, whether or not intentionally, causes the event which will facilitate their initial time traveling trip. This is the first and only episode where episode's name in the title card was shown. This is also one of the ten episodes in which the title card has an animation. The others are Pre-Hibernation Week, One Krab's Trash, Idiot Box, SpongeBob Meets the Strangler, Skill Crane, Karate Island, All that Glitters, The Donut of Shame, and The Krabby Kronicle. The episode parodies the black comedy Futurama, where Fry, the main character, was frozen in December 31, 1999 and was released in the future. Squidward is also frozen into the future. The calendar in the future says AD March 6, 4017. The words "past" and "future" switch places from when Squidward first enters the time machine and when he enters the past. Additionally, nothing is written on the lever when Squidward "falls" into the time machine near the end of the episode. When Squidward first arrives in the "Nowhere" zone, he has his clarinet. But when he begins running frantically, he does not hold his clarinet. When he falls through the roof of the time machine, the clarinet is back in his hand. When Squidward said "alone" in the Nowhere Zone, other voices said it too. These voices were voiced by the entire crew of the show. "SB-129" was originally going to be called "SpongeBob 3000". The episode first aired on December 31, 1999 its funny that it aired on the last day of the 1900s and the day before y2k and before the upcoming of the new century and millennium that happened on January 1, 2000. SB-129 was this episode's production code, and the code was kept. In SpongeBob SquarePants: SuperSponge, Chapter 3 takes place in the prehistoric Bikini Bottom. SpongeBob also uses a similar time machine to get there. When Squidward goes into the can opener room, he looks like a spring. When he enters the time machine, he returns to normal. in the early 2000s this episode and karate choppers were temporaily taken off the air, but later returned. This page was last modified on 6 April 2019, at 00:13. This page has been accessed 54,518 times.